Bali Spa The rounded shape building and their high quality of the technique with reasonable price are a secret of their popularity. 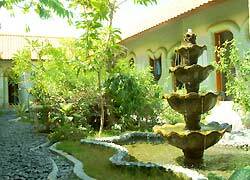 Well Being Spa is located on a quiet street close from the center of Semiyak area. Their 3 ～ 4 hours package, Intensive Cram Bath and Foot Treatment is highly recommended! Any men who want to enjoy a feeling of the royal family is more than welcome!! This is Swedish massage to ease stiffness of the shoulder and the pain. This body healing with essential oil of the natural plants makes your body and mind relaxed. Our hands and foot have hearts of all the energy running inside of the body. Stimulating them eases stress and nervousness, and then improves blood circulation and neural functions. At the end of the treatment, your body will be back in health. This is Well Being Spa’s original massage combined with Aromatherapy, Shiatsu, and Thai Massage. 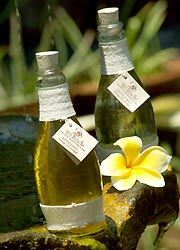 It is a mixed treatment of Javanese and Balinese styles starting off with Balinese massage with massage oil which made of natural herb. 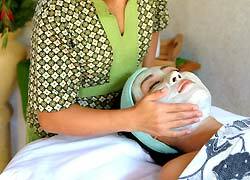 Then, they remove wastes of the skin by Javanese Lulur and smooth off your skin by yogurt body pack and ends with Flower Bath. 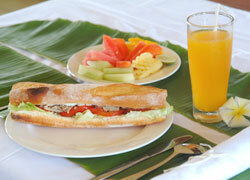 Enjoy the classic Balinese treatment! Polishing up a body by the Balinese Boreh and refreshing with yogurt body pack will make you beautiful from inside of the body. After Tropical Bath, enjoy ginger tea which has purification effect and ends with Aromatherapy Massage. You will be deeply relaxed from head to toes. 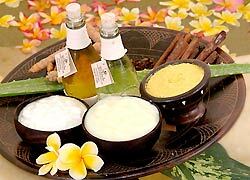 Package including Facial Treatment, Cream Bath (hair and head skin massage) and Pedicure & Manicure. It polishes up a body by Scrub with essence of the plants and smooth off the skin with Aloe or Seaweed extract. Enjoy the comfortable whole body massage! This course includes Well Being Original Massage; Massage Aromatherapy, Shiatsu, and Thai Massage. After polishing the skin by Body Scrub, Ozone Spa removes all the wastes of the skin. Facial, Manicure, Cream Bath and Pedicure will be done by two therapists at the same time in the end. It's a well balanced body treatment course including body massage, scrub, hair care and foot massage. This is a beauty course for women include body, face, head, hair, and foot massage, and intensive cream bath. Ozone spa removes wastes and toxin of the skin, so the skin becomes smoother. The water of Ozone spa is clear, but you will see it gets muddy because of body wastes. This is recommended all the skin types. They use essences of ylang-ylang, rose and lemon. It makes the skin refresh skin and helps a function of regaining health. They use full of seaweed containing minerals, so it is recommended dried and sunburned skins. Aloe does not only work for healing but also improves a function of metabolism. Sunburned skin can be treated by the course. Kuta, Seminyak, Kerobokan, Sanur, Jimbaran and Nusa Dua areas including the airport: Free transportation is available booking by more than 2 people. ※Ubud area: If more than 2 people book courses which at least one of them is over 2 hours course, free transportation area will be available with extra ＄15 per person for one way and ＄30 for two ways. Children can wait in the lobby or the treatment room. There are menus for children over age 3. Every time I go to Seminyak I love to see window shopping and this make me too much enjoy walking. After shopping then relax and take spa menu including reflexology at spa. All the spa staffs are friendly.